As you travel through Vietnam, you may come across a place called Phan Thiet. Phan Thiết is a coastal port city in Southeast Vietnam and the capital of Bình Thuận Province. With Phan Thiet becoming famous as a destination of natural landscapes and other attractions to visit. Phan Thiet has impressive pristine beaches, good roads and good standard restaurants among other things. Water activities are popular in Phan Thiet but there is the also worth visiting the Sand Dunes and checking out the fishing village. Here are some of the things to do in Phan Thiet Vietnam. Yes, there is Sand Dunes in Vietnam. The Sand Dunes are about 65 km northeast of Phan Thiet. There is a few interest things you can do here, such as. Sand Dunes attract many interested visitors. And it’s recommended to use suitable shoes which will make you climb the steeper areas more comfortable. If you are interested in exploring Phan Thiet city, renting a bike to explore is not a bad option. The bike rental costs between $8 to $12 per day. The traffic is usually busy and crazy so be careful. You are required to wear a helmet in case of an accident. The general area is fairly flat, so is not to challenging. Bikes here are widely available for rent, in different sizes. Old Mui Ne’s morning market offers the fascinating peek to the lives of the local Vietnamese fishermen. This is the one of the cultural thing to do where every morning you will see them going to the get the shore to catch fish. You will see their family members and wives sorting out the catch as they sell them to local traders, street food vendors and the restaurant owners. 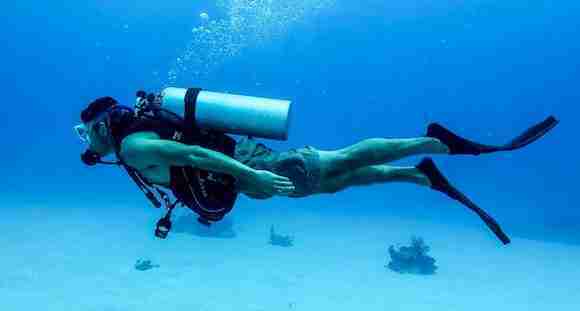 The Ca Na beach offers diving activities which are found in Phan Thiet. The coral reefs which are unspoiled and the clear blue waters has become home to marine life. In Phan Thiet and Mui Ne, Fairy Stream has become a photography hotspot because of the dramatic landscape of whites, reds, pinks and oranges. 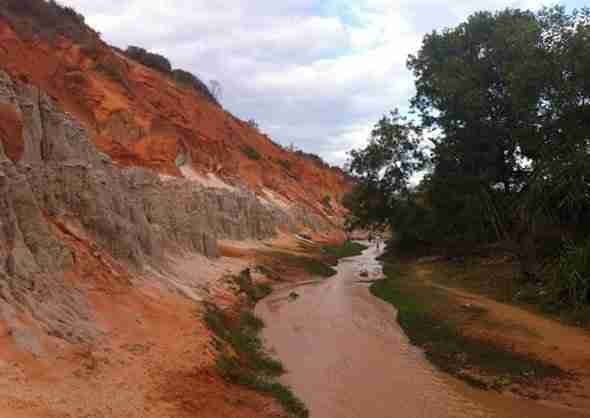 The stream is are about ankle-deep, which flows from the Mountain of Ham Tien’s Dinh and Fairy Stream features which are mixed of red and white sand dunes. You can walk comfortably on your barefoot as it is sandy with several stones. You can go hiking up Ta Ku Mountain. It’s about 35 -50 mins outside of Phan Thiet. Depending on yours fitness and experience the hike can take up to 5 hours. Once you reach the top, you will see awesome views of the scenery. This is really a popular day out for those trekking fans. There is loads of outdoor activities in Phan Thiet that will keep you busy. These are is the popular things to do in Phan Thiet for the more adventurous activity. 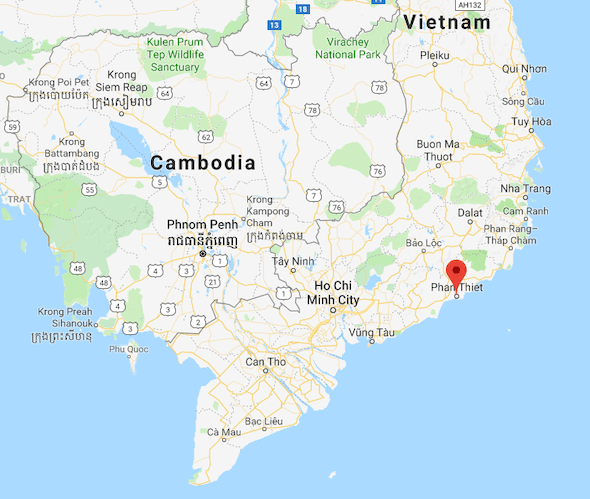 Here is the location of Phan Thiet Vietnam on the map. Phan Thiet has a reasonable supply of guest houses, hostels and hotels. Here are a few places to check out if you are planning to visit Phan Thiet Vietnam. Situated within 1.6 km of Phan Thiet Food Street, Khách sạn Mặt Trăng – Moon Hotel in Phan Thiet offers a private beach area, as well as free WiFi. All guest rooms at the love hotel are fitted with a seating area and a flat-screen TV with cable channels. With a private bathroom. Mui Ne Alena Hotel is situated in Phan Thiet, 16 km from Binh Thuan Bus Station. With a garden, the 2-star hotel has air-conditioned rooms with free WiFi. Rooms have a desk and a flat-screen TV. The rooms are fitted with a private bathroom. Finally, there is various activities which you can do while you are in Phan Thiet, which this place to be a well-known area with the surrounding activities and beautiful sceneries which you need to visit and see. And that’s it for now! 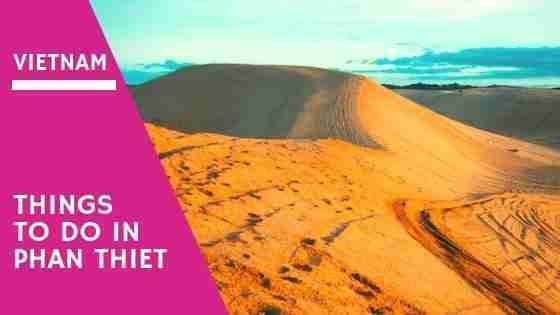 I’d love to know if this guide on the things to do in Phan Thiet Vietnam has helped you. Let me know if you have any questions and let me know if you go.